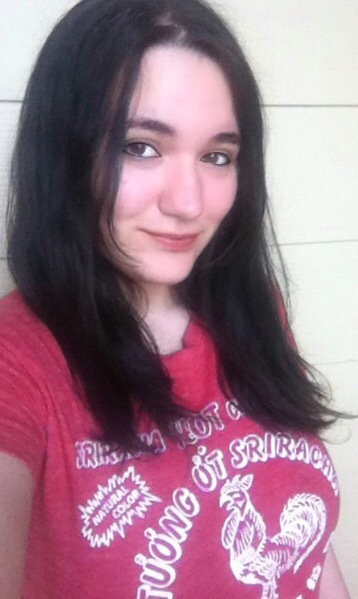 All my daughters are Sriracha freaks but my daughter Amani is such a fan that I recently delighted her with a Sriracha themed gift basket for her 18th birthday which included a Sriracha cookbook, Sriracha finishing salt, a Sriracha-to-go bottle on a key chain, Sriracha lip balm, and this Sriracha T-shirt. When you throw a bunch of savory sweet potatoes under that sweet spicy goodness…well you have a trifecta explosion of flavor that will have your taste buds begging for more! If you shy away from the sweet heat, feel free to skip the drizzle. Depending on the size of your sweet tooth, you may want to omit the brown sugar to dial down the sweetness. You can play with various spices to make this your own. It’s hard to go wrong when you are dealing with sweet potatoes, honey, and Sriracha! Cutting board, large knife, vegetable peeler, baking sheet, small bowl, metal spatula. 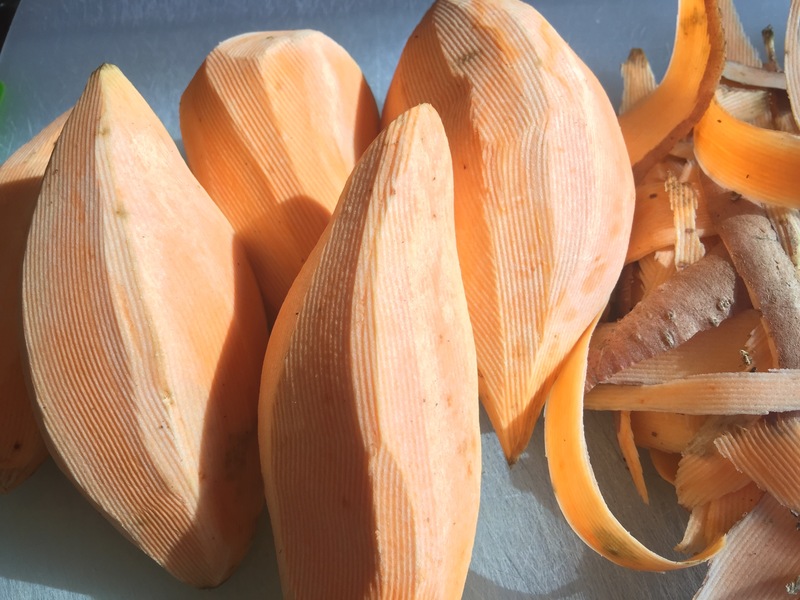 Peel and rinse the sweet potatoes. 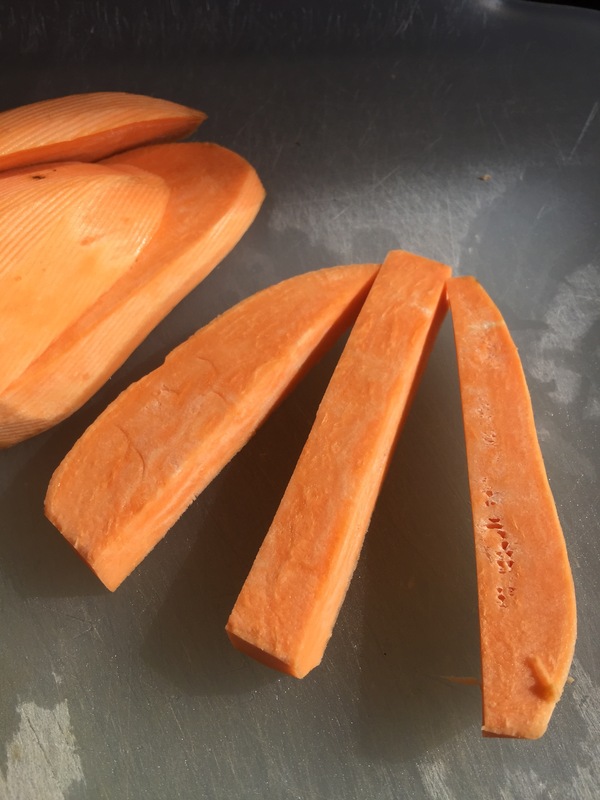 Cut off the end of the sweet potatoes (to make a stable base for cutting the wedges). 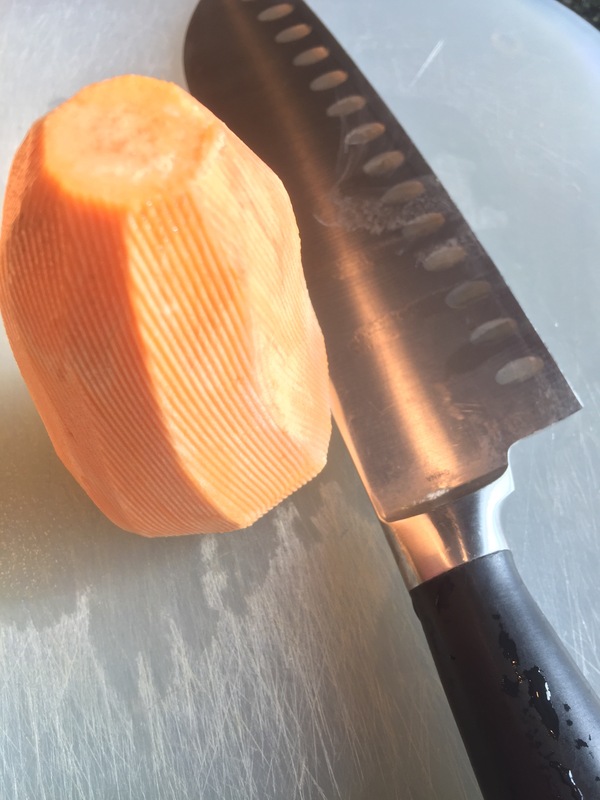 Cut the sweet potatoes into approximately half inch thick slices vertically. 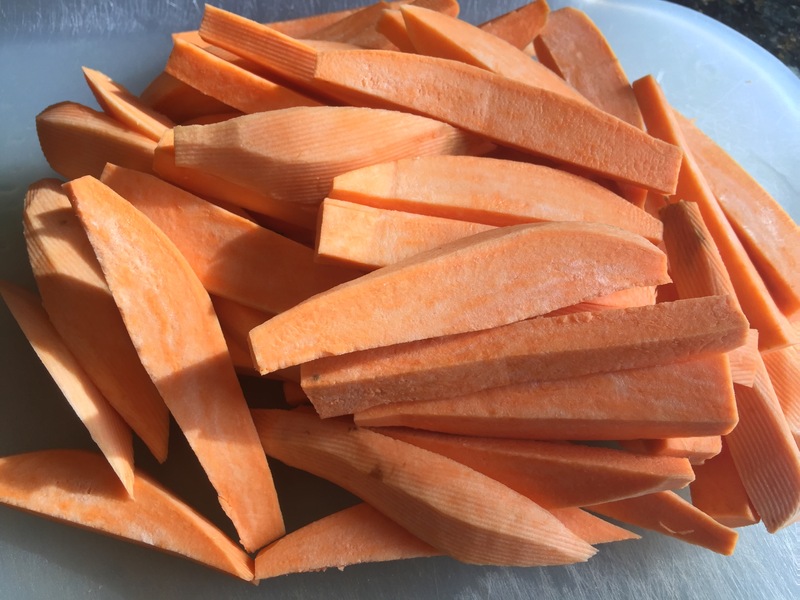 Cut each slice into approximately half inch wedges (like steak fries). Continue cutting the remainder of the sweet potatoes into half inch wedges. 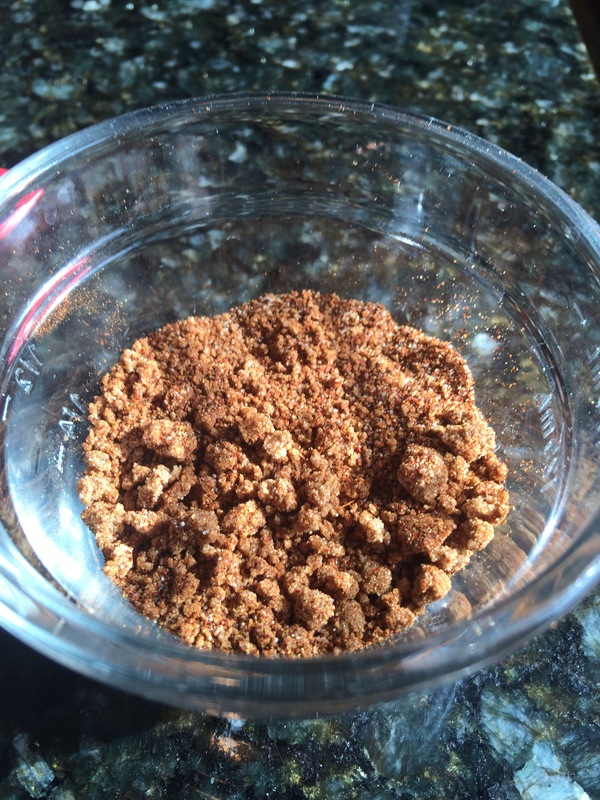 Place the brown sugar, chili powder, cumin, salt and pepper into a small bowl and mix together with your fingers or a fork. 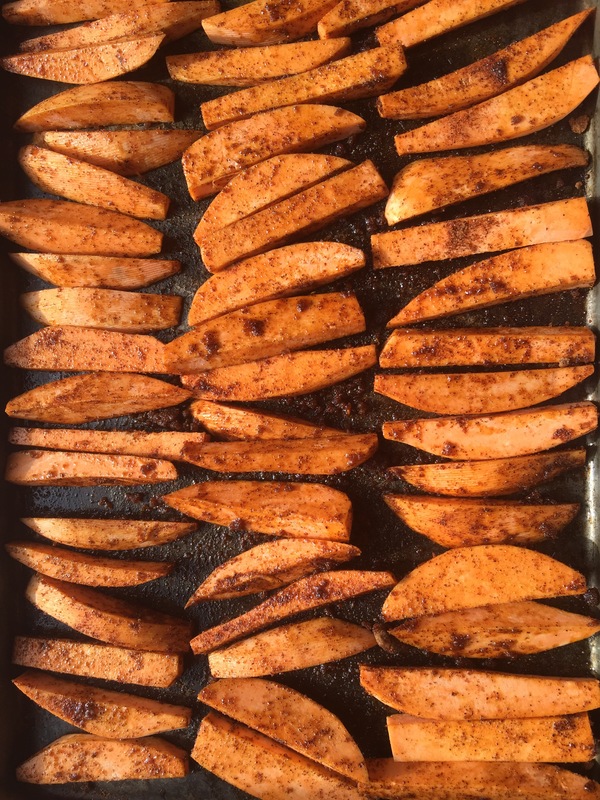 Place the sweet potato wedges on a baking sheet and lightly drizzle with extra virgin olive oil (enough to lightly coat each sweet potato wedge). 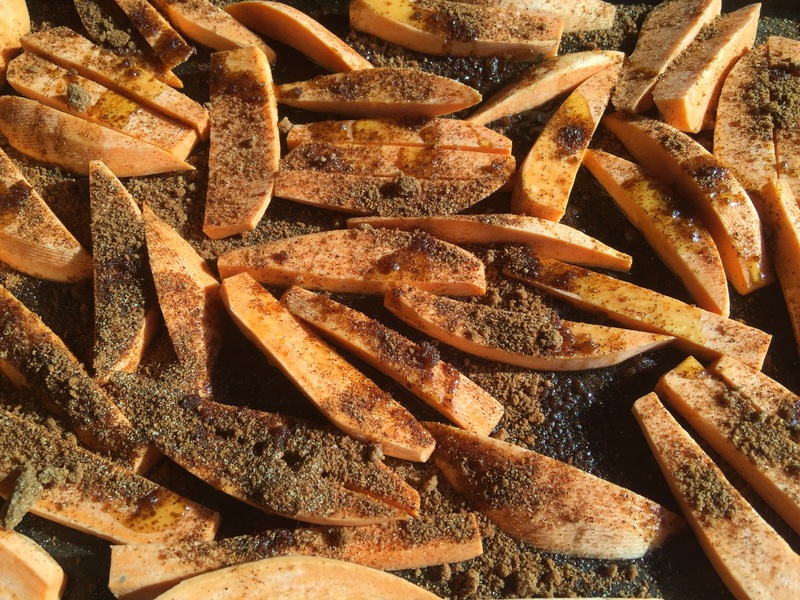 Sprinkle the spice rub over the sweet potato wedges and toss with your hands, being sure that each sweet potato wedge is covered with the spices. 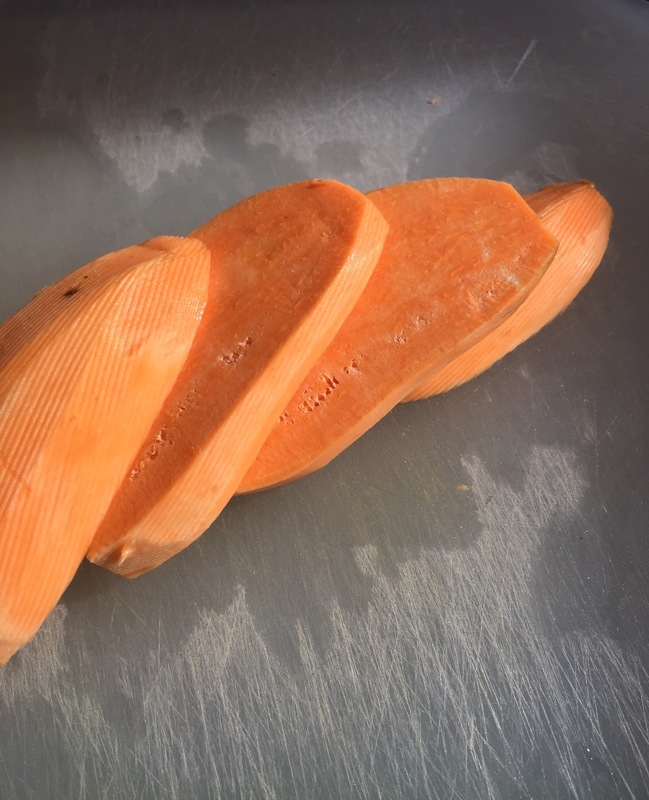 Arrange the sweet potatoes into a single layer on the baking sheet. This step is important to ensure browning on each wedge. Place into the oven for 15 minutes on 425 degrees. Check the potatoes every so often to ensure they don’t burn. 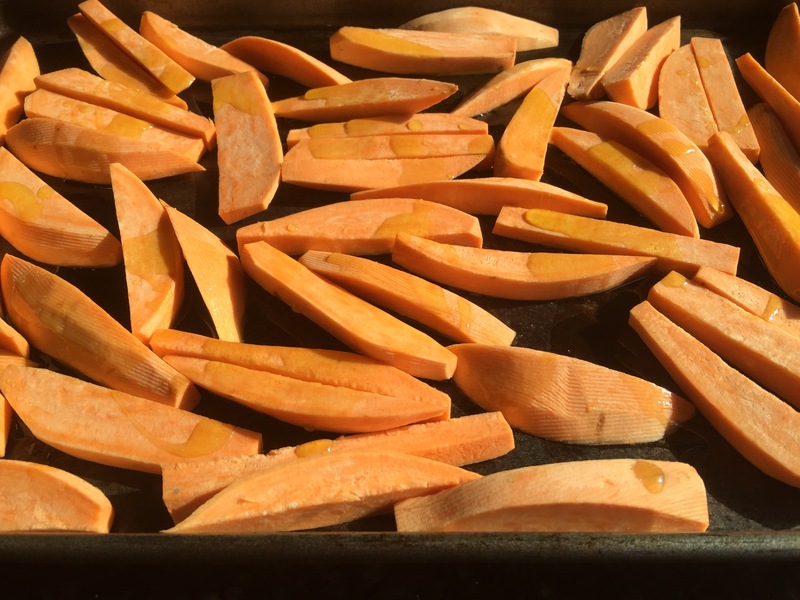 Oven temperature variations or the size of the sweet potato wedges could slightly alter the cooking time. 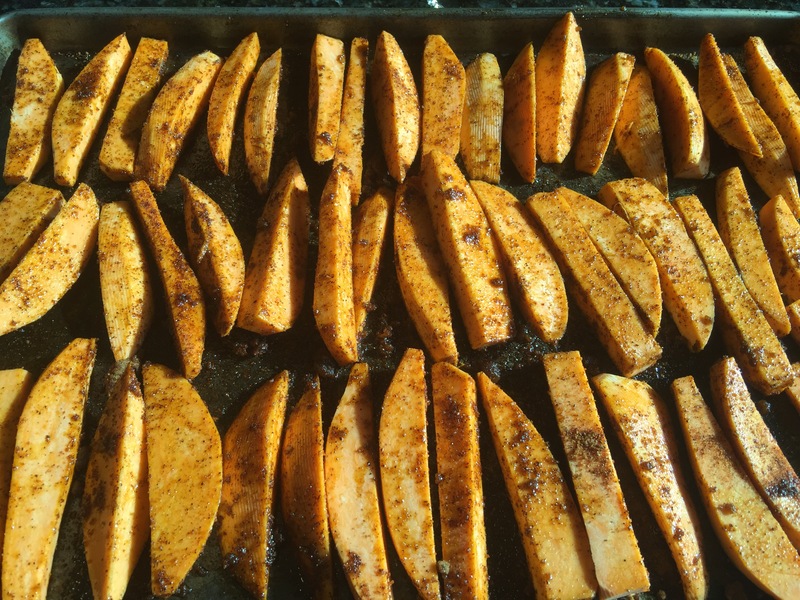 Once the sweet potato wedges are soft and slightly browned, turn the broiler on low and cook for another 15 minutes to brown the tops (this is much easier than flipping the potatoes wedges over). Keep a close eye on them, though, to make sure they don’t burn. If desired, switch the broiler to high towards the end to achieve your desired level of caramelization (but keep a watchful eye over them during the broiling stage). 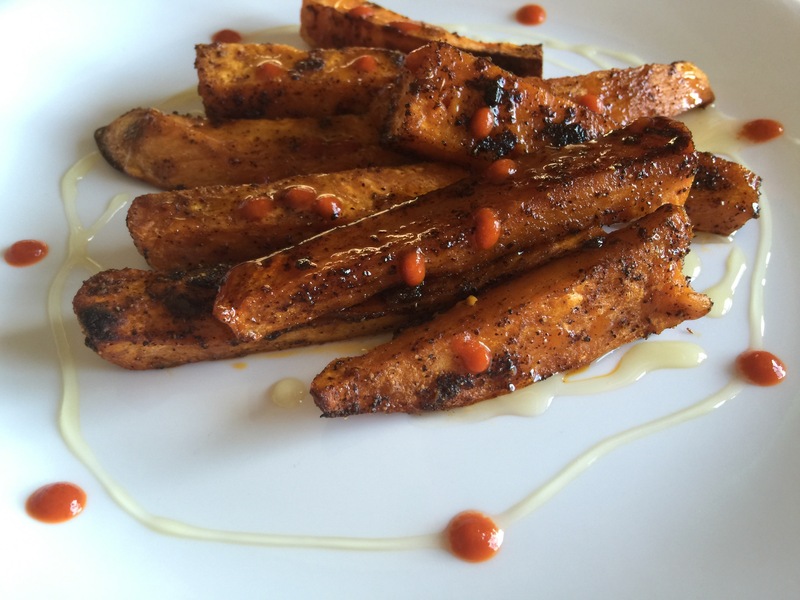 Remove the sweet potatoes from the oven and drizzle the cooked sweet potato wedges with a thin stream of honey and little dots of Sriracha (dots I say….that stuff is hot!). The only thing left to do now is savor the flavor.